The media trap is to be installed after your backwashing or “in/out” tank style filter. Its function is to protect your home’s plumbing fixtures from particles of filter media that might escape from the filter tank. This usually doesn’t happen, but the media trap will provide protection if it does. 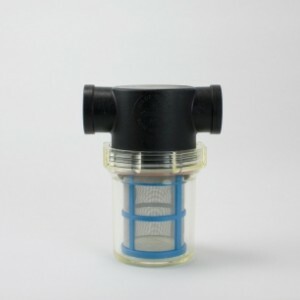 The filter trap has no cartridge to change, although you might eventually need to remove the clear bowl and clean the metal screen. When installing, please note the directional flow arrow. The filter trap is so light that your pipe will support it. There’s not need for a mounting bracket. Pure Water Products furnishes a media trap free with each of our backwashing or simple in/out filters.